The butterfly effect in chemistry: bimodal bond angles. Valence shell electron pair repulsion theory is a simple way of rationalising the shapes of many compounds in which a main group element is surrounded by ligands. ClF3 is a good illustration of this theory. Total: 10 = five electron pairs. the lowest is between two bond pairs. As applied to chlorine trifluoride, it results in a trigonal bipyramidal geometry for the shape-determining five electron pairs. One of the trigonal positions is occupied by the pair deriving from a Cl-F bond (F=white, Cl=red below). The other two trigonal positions are occupied by two sets of electron lone pairs (yellow below) at ≥ 120° (rule 5, but much more and the repulsions between the lone pair and the trigonal Cl-F bond would become too great, rule 6 above). The remaining two Cl-F bond pairs occupy the di-axial positions (rule 7 above). The above at least is the standard “text-book” picture. Regular readers of this blog may have noted that I often like to question the text books. So here goes. My issue is with the above explanation, of five electron pairs all associated in some way with the central atom. An expanded octet in other words. Well, if you take a look at earlier blogs, you may have observed that this expanded octet is not real (IMHO). If it’s not real, then we cannot be dealing with five electron pairs. Can VSEPR work with only eight electrons in this instance? And what are the coordinates of the so-called two “lone pairs”: is the angle subtended at the Cl by them really trigonal (~120)? I start with computing an accurate wavefunction, using the DFT-based ωB97XD/6-311++G(d,p). The electron count and the coordinates of the localised basins will be obtained using ELF (Electron localisation function). 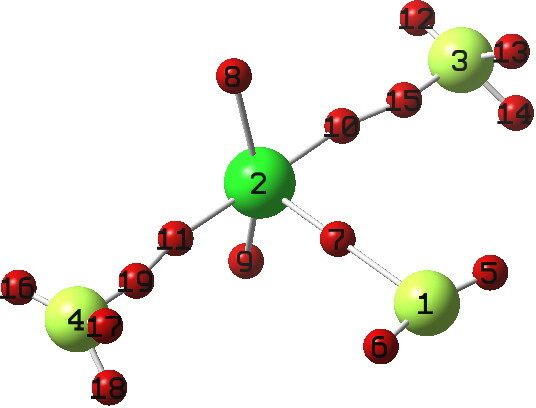 The electron basins are shown here as red spheres; 8 and 9 are the “lone pairs”, as it happens a very reasonable description since the populations for these are 2.07e. The 8-2-9 angle of 154° results from rule 5 above; lone pairs repel greatly. Indeed, one might almost describe 8 and 9 as being di-axial. In which case, the geometry is not that of a trigonal bipyramid but is closer to that of a square pyramid. Basin 7 is a Cl-F bond, with a population of 0.87e, rather less than a “pair” (the Wiberg bond index is 0.82). Basins 11+19 and 10+15 (similar basin splitting is observed for F2) each total 0.91e; again less than a pair (Wiberg index 0.63). So the three Cl-F bonds are < 2-electron bonds and so their mutual repulsion might be expected to be less than rule 7 above. Indeed, any small 2-electron-3-centre 1-4 or 1-3 contributions (Wiberg index 0.07) might cause these bonds to actually move together resulting in the "T" shape in which the angle 4-2-3 is actually < 180° (174). Other features include eg the orientation of the “lone pairs” on fluorines 3 and 4, in which e.g. 16 is oriented anti-periplanar to the 2-1 bond. This is in fact an anomeric effect! An NBO analysis reveals E(2) between Lp16 and σ*2-1 to be 6.3 kcal/mol, a relatively weak but still a real anomeric interaction. The total electron count for the ELF basins surrounding the central Cl is 6.84, not 10 as was implied in the simple argument set out above. VSEPR theory is a highly simplified way of looking at the geometric origins of this odd little molecule; an ELF analysis likewise paints only a partial picture. Indeed, it seems doubtful that any simple way of regarding this species can ever be entirely adequate. But we should be mindful that the “EP” (electron pair) of VSEPR might itself be rather misleading in perpetuating the idea that such main group elements contain expanded octets. But the geometry of chlorine trifluoride makes sense without imposing 10 valence electrons on the chlorine after all! See slso bromine trifluoride and crystal data for such species. This entry was posted on Saturday, July 27th, 2013 at 3:28 pm and is filed under Hypervalency, Interesting chemistry. You can follow any responses to this entry through the RSS 2.0 feed. You can leave a response, or trackback from your own site. 1. Firstly “lone pairs”. It is true that if lone pairs are considered simply as contributors to the overall electron density, there is no reason that they should retain any individual identity as a “pair”. The density due to such “lone pairs” is often smooth, with no features or inhomogeneity separating the individual lone pairs. “Monovalent” fluorine has three such lone pairs, but the density arising from them can be considered as forming a tube or torus surround the F atoms. ELF does not always show such homogenous behaviour, because of various factors such as the quality of the basis set used to describe the distribution of electrons, the resolution of the grid of ELF values used to compute their centroids and the algorithm underlying their location. So yes, “lone pairs” can indeed merge into a “super pair” and the distribution of this super pair can indeed adopt forms such as a torus not normally associated with the “:” Lewis representation of lone pairs. 2. Multiple bonds considered as a single bond. Like the lone pairs, we are asking what the distribution of the electron density in a bond looks like. It can have just a single “feature” (one disynaptic ELF basin), but that single feature can be associated with a non-single bond order (1,2,3, 4 etc). More interestingly, ELF often shows up as two disynaptic basins associated with a double bond, which resemble the “banana bond” representation. Even odder is that the reverse can happen. Thus a “true” single bond can be represented by multiple features, or basins. In the post http://www.ch.imperial.ac.uk/rzepa/blog/?p=18993 two of the three “single” bonds in ClMe3 have two ELF basins, not one. The “single” bond has if you like internal structure. The best known single bond with such structure is F2 (see http://www.ch.imperial.ac.uk/rzepa/blog/?p=18993#comment-277210 where the bond is “represented” by two ELF basins, not one. Such features are often associated with a particular type of single bond known as a “charge-shift” bond. So both lone pairs and bonds are our way of representing what is happening to the electron density and simple representations as “:” or “-” may end up being quite misleading. I have a question please answer me. I research on N2H4, P2H4 and As2H4 compounds. I think Two lone pair on N,P, AS but I cant calculate amount of repulsion between two N and two p and two As for any compound. please answer and guide me. VSEPR Theory: A closer look at chlorine trifluoride, ClF3. is licensed by Henry Rzepa under a Creative Commons Attribution-Noncommercial-Share Alike 3.0 United States License.